Spring has officially sprung, and to say we're excited about the coming of warmer weather, sunshine and greenery is an understatement. As a sustainability-minded group, the TIS crew also loves the coming of Spring as a celebration of our beautiful planet. 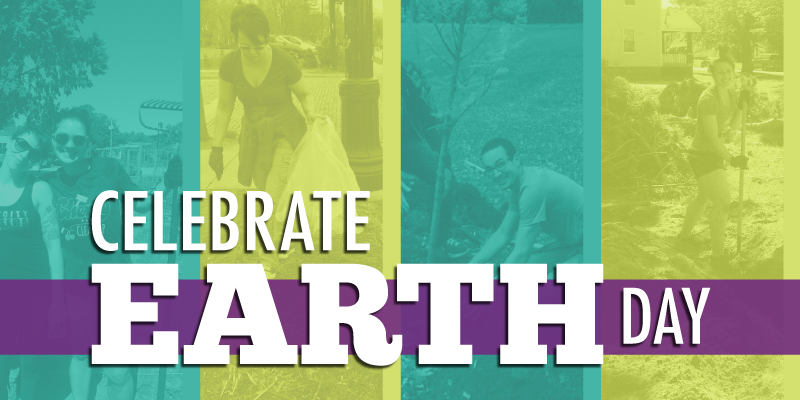 Throughout the month of April, there are plenty of ways you can celebrate Earth Day this year (Saturday, April 22) in Grand Rapids. Check out these 10 events below for starters—chances are you'll catch a TISer or two there, as well! Part of the Grand Rapids Film Festival, the HBO documentary Saving My Tomorrow features kids from around the world who are committed to protecting the earth. Get inspired by these kiddos this Saturday at Wealthy Theatre! Hosted by The Wege Foundation at Aquinas College, Untold Stories of the Conservation Movement: Race, Power & Privilege will be lead by speaker Dorceta E. Taylor, Ph.D., director of diversity, equity & inclusion at the University of Michigan School of Natural Resources & Environment. The discussion will explore the lack of diversity in the conservation movement and is sure to be an incredibly relevant and interesting dialogue. Grand Rapids grassroots non-profit organization Our Kitchen Table exists to address food and health disparities in Grand Rapids’ southeast urban neighborhoods. With their upcoming event, Food Justice Primer, OKT aims to introduce the concept of food justice to attendees and how we can practice food justice in Grand Rapids. Join them in their work to help GR residents by strengthening their access to healthy living resources! This month's Green Michigan Sustainability Series with Harmony Hall—Pollinator Plants and Trees for Butterflies and Bees—will teach attendees how to plant pollinator gardens and trees in your own backyard. You can even pre-order trees perfect for pollination at this event! Looking for an excuse to fancy up and contribute to Grand Rapids' sustainable local water movement? Join WMEAC for their third-annual Blue Tie Ball at the Goei Center on Thursday, April 20—a fundraiser for their water protection programs and a celebration of Earth Day. Mix and mingle with live music, delicious cocktails and food—all while supporting our local resources! The March for Science is a national event that will take place on Earth Day this year and calls upon citizens of Grand Rapids and nationwide to demonstrate their passion for science, as well as support and safeguard for the scientific community. Climate change is real, people. Show your support at the March! Also taking place on Earth Day, Baxter Fix-Up Day is the Baxter community's "all hands on deck" day of service for the neighborhood's residents, as well as the Baxter Community Center's staff, family and friends. From 8 am - 12 pm, volunteer your time to help make improvements both inside and outside of the Baxter Community building. Interested in working for a green/sustainability-focused company? The Think Green Jobs Fair was designed to introduce the minority community to jobs and entrepreneurship opportunities of the future that are created by the Green Industry. While mainly intended for the minority community, this event is open to all; whether you're a student, parent, community member, or already in the job field. Join WMEAC's monthly Green Drinks event at The Geek Group on Thursday, April 27 to watch members of Geek Group create some cool shtuff. Check out their YouTube channel to get a taste of what might see at the event. Arbor Day is Friday, April 28—and what better way to celebrate than to get your hands dirty planting trees with Mayor Bliss?! Attend the Mayor's Greening Initiative with Friends of Grand Rapids Parks in partnership with the City of Grand Rapids to help Mayor Bliss and other volunteers plant over 350 trees in and around Martin Luther King Jr. Park. This is a great event to participate in with co-workers! Looking for other ways you can help our planet this Earth Day (and every day)? Here are some simple sustainable habits you can implement in the office! And browse the rest of our Sustainability-themed posts on the TIS blog for more green-practice inspiration.